Early in the summer, Rev. Weldon McWilliams IV along with 25 others, walked into Rockland Kosher Supermarket, tucked behind the intersection of Routes 59 and 306, and bought groceries. Not very remarkable. It is a grocery store, after all. But it’s a niche grocery store, a very large one that contains only kosher certified products. 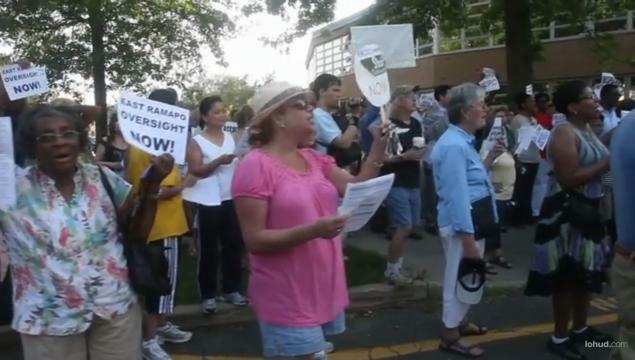 The event was a kick off for Wake Up Rockland, a grassroots group focused on organizing against the in-power status quo in Ramapo, and McWilliams chose the grocery store to stress the boundaries that separate the community. And while no one has ever said that someone not dressed in black hat or sheitl is prohibited from shopping in Rockland Kosher, it is obvious who makes up the customer base for that store. McWilliams, 34, understand symbols, however, and Rockland Kosher is a good one. McWilliams had rallied the media necessary to get noticed. His desire was to draw attention to the separation of community in the Town of Ramapo, in particular in the ever-roiling situation of the East Ramapo schools, where the Orthodox Jews control the majority of seats on the nine-member board. He also wants to draw attention to the actions of town officials, where zoning appears to favor the large Orthodox community’s needs. It was an interesting gesture. Each person in the group walked in, selected an item, paid and walked out. There was no threat in the act. They could have staged a boycott instead of other chasidic run businesses, although perhaps at this point our communities are so separate that a boycott would have been rendered meaningless by the fact that Jews and the other ethnic groups that populate the town don’t do a lot of shopping in each other’s stores. McWilliams grew up in Spring Valley, the son of a minister. He holds a doctorate in African American Studies from Temple University and found himself back in the area, teaching at Duchess County Community College. Wake Up Rockland was his effort to shake things up, and he has since announced his candidacy for the Ramapo Town Board on the Preserve Ramapo ticket. I had never considered that a grocery store could serve as a symbol of what divides us. I always feel a bit alien entering Rockland Kosher, reminded by signs outside that I need to be dressed in modest attire to shop there. But I also feel a bit out of place at Foodmart International, a large supermarket down Route 59 from Rockland Kosher that caters primarily to the Hispanic community. I occasionally shop in both, however, when I need a particular item I can’t find elsewhere. There’s buy-in, exclusion and community, all wrapped up in the places where we shop to stock our pantries. What is the nature of community in this time and place? Are people butting up against the natural insularity of the Orthodox, who fear secular and outside influences? Or do they suspect there is something more insidious going on, masked as protecting a religious way of life? In my nearly two decades in this county, the tensions have escalated and the divisions seem starker. We all seem less interested in creating communal good and more interested in preserving our share of the pie for ourselves alone. Adler feels that the Wake Up Rockland’s buy in was “an olive branch” offered in the name of dialogue, something that has been in short supply in the county of late. Without it, he says, there is no way to bridge differences or create a forum for respect. The Journal News reported on the rising tension in the East Ramapo School District last year, describing how the public school systems set up by New York State could not envision a place like East Ramapo, where nearly 20,000 students attend 120 yeshivas and only 9,000 students – largely minority – attend 14 public schools. According to the Federal Education Project of the New American Foundation, only 7.2 percent of those attending district schools are white, with blacks and Hispanics making up 84 percent of the students. To be fair, the chasidim pay taxes just like everyone else, and they want to ensure that they get what they need for the dollars they spend. At the same time, you cannot help but see the contrast: an Orthodox school board whose children do not attend the public schools making decisions for children whose first rung on the ladder of the American dream are those public schools. Frances Pratt has served as the head of Nyack’s NAACP for 34 years. She has been involved in activist politics since the earliest days of the civil rights movement. Her genteel manners have graced many a county rally, probably shaming most of us for simply not knowing how to behave better. Pratt notes that the chasidic community is organized. It has a sense of discipline when it comes to getting what it needs, and a sense of entitlement regarding resources. That sense of organization is something that the minority community could benefit from, she notes. “It doesn’t matter what you try to enforce with reference to race relations,” says Pratt. “If you are not consistent, it is not going to pan out the way you want it to. You can’t have a few rallies and not come back and have more rallies. To Yisroel Schulman the McWilliams’ buy in may have been a splashy way to bring attention to what divides the community, but in some ways it drew a false dichotomy between two groups, when the area, is in fact, made up of many. His own neighborhood boasts an Indian grocer, bodegas and a hallal meat shop. Schulman says he’ll run into those to buy a soda, but as someone who keeps kosher, he will never buy meat at any of them. “We are always going to have a slightly segregated society,” he says, a comment that resonates with my own practice. Schulman has made a career of offering legal services to the underserved, as a co-founder of New York Legal Assistance Group (NYLAG). He is also a longtime Rockland resident, who has long been involved in Jewish organizations throughout the county, including Rockland Community College’s Hillel, the Jewish Federation of Rockland County, and several Orthodox schools. The community has many areas to find common cause, he says. Affordable housing, health care, and unfunded state and federal mandates for special education are areas that all the residents of Ramapo should be able to find ways to work for a greater good. But a limited budget, resident’s distaste for paying more taxes and a school system burdened by fixed salary and property costs has forced tough choices in the public schools. “Do you cut the school day, or do you cut gym,” Schulman asks. It is not enough to serve the interests of only our own kind. We as Jews may all be responsible for one another, but if we seek involvement in the wider community, we are also responsible to not only navigate the system to better serve us, but also to steward the institutions that have been entrusted to our care for a greater good. Hillel admonished us not to separate ourselves from the community. How we choose to define community will define our county in the long run. Is it just our community, or is it something larger? To paraphrase that great sage, we have to stand up for ourselves. But if we are for ourselves alone, we are no longer doing our duty as Jews. As we head into Rosh Hashanah — and a new school year — we should consider what exactly community means and how we want to shape it. Marla, as always, your writing is superb and thought provoking. Interestingly, though not Orthodox, I never felt alien entering or shopping in Rockland Kosher Supermarket. Grocery stores have signs that say shirts and shoes are required. Rockland Kosher requests a bit more modesty. It doesn’t bar anyone from entering, and I have seen not so modestly attired folk in the store. It is amazing what one takes for granted. Even though I now live near a strongly Jewish community outside of Philadelphia, kosher food is not around the corner. I miss the availability. Kosher consumers in Rockland are very fortunate. I hope the Rockland community heads in a positive direction and prospers for all it serves. I grew up , married and lived for a while in the North West Bronx, a beautiful place. My husband and I had a beautiful apartment in one of the very first Jewish Garment workers co-operative buildings built in the area. It was great, the majority in the buildings were Jewish and many were also survivors of the camps.They kept kosher, went to Schul,educated their children and were kind, receptive and interacted with me, my husband and our child. They were not Chassidic, but were reformed, orthodox and conservative people practicing their faith while and living side-by-side with Christians. We shopped in their stores and ate in their restaurants. I never felt unwelcomed or shunned. However, the climate here in R. C. is much different. Perhaps, there should be a meeting of what is common and not what divides . Perhaps, we should all realize one cannot have everything and one needs to share. Isn’t that what we all teach our children. I am sick of the bickering, fear, hate and the divisive rhetoric on both sides. I want to be able to stay in my home. I don’t want to live in dilapidated area ( as RC is becoming) because people who can get out. I want the public school system to be ,as it was meant to be for all children regardless of race, creed or ethnicity. I want that system to prepare all our children to be contributors to our society, because if we don’t do this we will have a society that fails all of us.